She took her passion for art, literature, design, music and psychology into a degree in visual culture and sociology, for which she received the Deanʼs Award for ʻoutstanding academic resultsʼ. Nina also studied the cello for a decade, in addition to composing and writing songs with guitar, piano and voice. Creative practice and playful exploration run alongside theoretical knowledge and intellectual enquiry as key components to Ninaʼs teaching philosophy. She explores the psychosocial and intuitive components of learning, fostering the principle that education is an art which must speak to the learnerʼs experience in order to awaken the imagination and the ability for critical thought and curiosity. Nina ignites, in her students, innovative and imaginative ways of thinking and being, with a focus on observation and instinct, which is grounded in science and technique. Her involvement in voice transcends the arts to combine artistic foundations with cross cultural communication in assisting migrants further their English—in regards to phonetics, socio and para-linguistics. 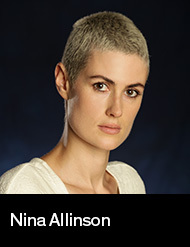 Nina is a NIDA scholarship student. In November, she travelled to Europe to teach at the University of Berlin, attend voice conferences in Russia, and to work one-on-one with the likes of Barbara Houseman in London.